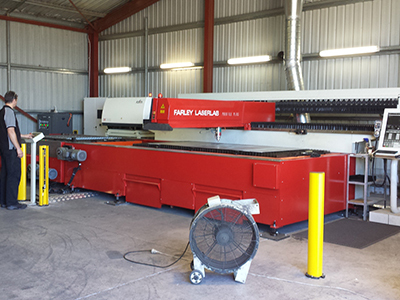 Farley Laserlabs new LT9035 is a milestone advancement in new Fibre Laser cutting technology. Specifically designed for high volume cutting of tubes and pipes the LT 9035 provides far greater efficiency than normal laser systems when cutting pipes and tubular metals. New enhancements allow the LT9035 to position and move tubes and pipes mechanically (eliminating manual handling) to increase speed, precision and productivity. Full automatic Feeding system – regular and rectangular pipes can be integrated into a fully automated feeding process, without human operation. Advanced clamping system can self adjust focus according to material size, automatically adjusting clamping force, this ensures that the correct amount of clamping force is applied so that pipes do not get damaged. Corner fast cutting system provides fast response to corners, greatly improving cutting efficiency. High efficiency unloading system – the LT9035 can be set to automatically unload finished work pieces, gently and safely in designated areas.